Nyonya Kebayas are a hot commodity among fashion designers but the sense of tradition is either missing in many of the new fusion designs or lost in the hefty price tags. Yew hard at work at her sewing machine. Not wanting to see glitter and glamour get in the way of what a truly traditional Nyonya Kebaya is, Penang Nyonya Lily Yew Chooi Lian took up the hobby of sewing the transparent garments three years ago. Spending about five hours to make one kebaya, Yew has made numerous garments for friends and family and has had several of her creations flying off to distant places like San Francisco and Saigon. “What used to be worn for going out of the house is now reserved for festive and formal occasions and it is a pity because the Kebaya is so elegant and beautiful,” said Yew. “The Kebaya is part of my cultural heritage and it looks good for all occasions, which is why I took up sewing the blouses three years ago,” she added. While the more than RM1,000 price tag on most modern Kebayas prevent many from owning one, Yew does what she can to spread her love for the traditional wear by making it affordable for friends and family. Her quest for affordable material was a long one because the embroidered sleeves and hems are difficult to do. “The motifs are done by machine and are usually floral but with the imagination of some embroiderers, you can find cute animals, insects, geishas in kimonos, little China dolls, dragons and phoenix, to name a few,” said Yew. Luckily, Yew was able to find a cheaper alternative with a shop that orders the material from Indonesia, but stocks can be sporadic. This style leaves no margin for mistakes and makes it very hard to sew, which is why Yew only does them in standard sizes of small, medium and large. 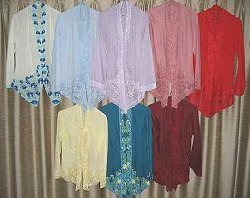 Some of the Nyonya Kebaya's made by Yew. 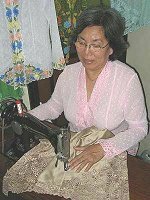 Yew is open to orders from people but stressed that she is only sewing the Kebayas in her spare time as she is a busy grandmother. Yew has a variety of fabrics that customers can use to make the transparent blouse. “I want to share my love for the Kebaya and make it affordable,” said Yew. The Kebaya began as a long sleeved blouse with lace appliquéd around the edges. It is the traditional costume of Straits Chinese ladies and other Peranakan women from Indonesia and Thailand. It is worn with a Javanese batik sarong and to be properly dressed, a Nyonya will have her hair in a chignon (sanggul) with flowers and gold pins. The lapel of the Nyonya Kebaya is held together with a set of three brooches (kerosang) while the sarong is folded and secured with a gold or silver chain-link belt. For the feet, beaded slippers are a must. In Penang Hokkien, the Kebaya is called Pua T’ng Teh, meaning midway between long and short. For the modern look, the Kebaya can be worn with pants, over a simple sleeveless or spaghetti-strapped dress or even used over a tank top as a jacket. Materials used to make the Kebaya include coarse voile (kasar robia), non-iron georgette and shantung for its lovely sheen. Nyonya Kebaya has to be hand washed, using a little starch for the voile ones so they can last a long time. Antique pieces have lasted through the years because of the use of starch.